This coral growing near Ojo Norte off the coast of Mexico is not present in the low-pH zones. Species richness increases with distance from the ojos. Photo by Elizabeth Crook. Graduate student Elizabeth Crook conducted surveys at ojo sites in Mexico. The naturally low pH (a measure of acidity) in the water around the springs creates conditions similar to those that will result from the widespread acidification of surface waters that scientists expect to occur as the oceans absorb increasing amounts of carbon dioxide from the atmosphere. Ecological surveys around the springs found small, patchily distributed colonies of only a few species of corals, without the structurally complex corals that compose the framework of the nearby Mesoamerican Barrier Reef, one of the Caribbean's largest coral reef ecosystems. 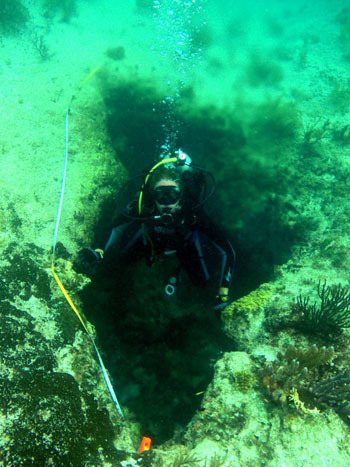 A team led by scientists at the University of California, Santa Cruz, has been studying the submarine springs at Puerto Morelos near the Mesoamerican reef for the past three years. The researchers reported their findings in a paper published in the journal Coral Reefs (published online Nov. 20). "This study has some good news and some bad news for corals," said coauthor Adina Paytan, a research professor in the Institute of Marine Sciences at UC Santa Cruz. "The good news is that some species of corals are able to calcify and grow at very low pH. The bad news is that these are not the ones that build the framework of the coral reefs. So if this is an indication of what will happen with future ocean acidification, the reefs will not be as we know them today." The submarine springs, known as "ojos," occur along the eastern coast of the Yucatan Peninsula. Limestone "karst" landforms near the coast feature underground drainage systems that discharge brackish water at the ojos. The discharged water has lower pH than the surrounding seawater, and these conditions have existed for thousands of years. Lowering the pH affects the chemical equilibrium of seawater with respect to calcium carbonate, reducing the concentration of carbonate ions and making it harder for organisms such as corals to build and maintain structures of calcium carbonate. Paytan's team monitored the pH and other conditions at ten ojos and conducted ecological surveys around each site. The researchers found that the number of coral species and the size of coral colonies declined with increasing proximity to the center of an ojo. 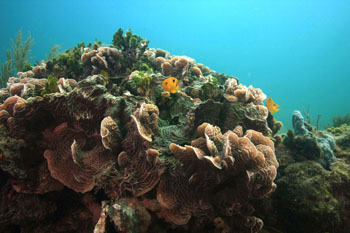 Only a few species of hard corals were found in waters with the lowest carbonate saturation levels, closest to the ojos. These species are rarely major contributors to the framework of Caribbean reefs, but their ability to form carbonate skeletons in low-pH conditions warrants further study, Paytan said. "We need to understand the mechanisms that allow these corals to calcify at these low-pH conditions. We should also make sure that the places where these species occur are protected," she said. The low pH and low carbonate saturation near the ojos are comparable to the conditions scientists expect to see worldwide due to ocean acidification by the year 2100. Other conditions at the ojos are different, however, including somewhat lower salinity and high nutrient concentrations in the discharge water. Evidence from previous studies suggests that the low salinity is not responsible for the patterns seen around the ojos, since coral species that tolerate similarly low salinity occur in the region but were not found near the ojos. The high nutrient concentrations may benefit the corals, helping them compensate for the increased energy needed for calcification under low-pH conditions. Elizabeth Crook, a graduate student in Earth and planetary sciences at UC Santa Cruz, is first author of the Coral Reefs paper. In addition to Crook and Paytan, the coauthors include Donald Potts, professor of ecology and evolutionary biology at UCSC, and Mario Rebolledo-Vieyra and Laura Hernández at the Centro de Investigación Científica de Yucatán. This research was funded by the National Science Foundation.